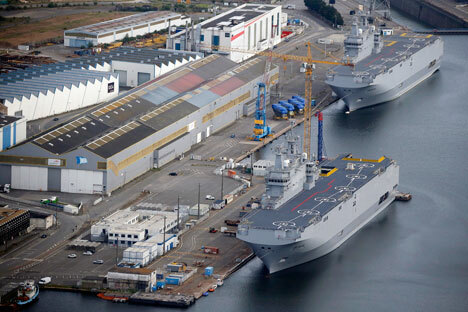 Russian shipyards received from France considerable funds for work on building stern parts for two Mistral helicopter carriers long before the decision was made to break off the agreement, a source in the Russian shipbuilding industry told Interfax-AVN on Aug. 6. "This sum equals 80 million euros. France paid namely this much for two stern parts," the source said. Stern parts of both helicopter carriers were built at the Baltic Shipyard, which is part of the United Shipbuilding Corporation, the source said. "At that, the scheme of financial transfers was as follows: Rosoboronexport transferred funds to its French contractor, DCNS company, which in its turn paid its contractors - French company STX France [which built the front part and assembled the ships] and the United Shipbuilding Corporation," the source said. "Thus, about 80 million euros was returned to Russia earlier," the source said. All payments for the building of the stern parts of two Mistrals have been made, director of the United Shipbuilding Corporation department for military and technical cooperation Alexei Diky told Interfax-AVN. It was reported that the contract for construction of the two helicopter carriers is worth 1.2 billion euros. France had earlier received 840 million euros of this sum. The Kremlin press service reported a day earlier that "during their consultations held in a friendly atmosphere, as is traditional in the Russian-French relationship, experts came to a mutually acceptable agreement on reimbursement of the funds paid by Russia under the contract and the return of the shipped Russian equipment and material." "France has already transferred the said funds and after return of the equipment will acquire the right of ownership and be able to dispose of both the ships. Moscow considers the Mistral issue fully settled," the Kremlin said. Russia will receive the sum, which corresponds with its expenses, French Defense Minister Jean-Yves Le Drian said in an interview with the RTL radio station on Aug. 6. Rosoboronexport and France's DCNS signed a contract to build two Mistral-class helicopter carriers in June 2011. The St. Petersburg-based Baltiysky Zavod, part of the United Shipbuilding Corporation, built the sterns. The STX France Saint Nazaire shipyard attached the sterns to the bows and put the finishing touches to the ships. The delivery of the first helicopter carrier, the Vladivostok, to the Russian Navy was due in the middle of November 2014, but the French administration refused to honor its contractual commitments under pressure from NATO allies, primarily the United States, using the escalating tensions in eastern Ukraine as an excuse. The second carrier, the Sevastopol, was supposed to be transferred to Russia in fall 2015. Western sanctions imposed on Russia imply that military-technological contracts signed in the previous period must be fulfilled.